2019 opened up with a massive gun rights rally in the Keystone State on January, 7th. After just weeks of planning, Justin Dillon, the founder of the advocacy group Open Carry Pennsylvania, along with gun owners and activist from different parts of the country were able to pull off a massive gun rights rally outside the office of Mayor, William Peduto (D) of Pittsburgh, Pennsylvania. On December, 14th, 2018. Mayor, William Peduto joined by Governor, Tom Wolf introduce three gun bills aimed at combating “gun violence”. 1) An assault weapons ban within Pittsburgh city limits. 2) Accessories, ammunition and modification ban barring items such as bump stocks, armor-penetrating bullets, sawed-off rifles, and large capacity magazines. 3) The introduction of red flag laws. 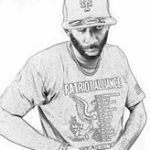 Which enable courts to temporarily prohibit a person from having guns if law enforcement or immediate family members show that the individual poses a significant danger. Mayor, Peduto has also asked Mayors across Pennsylvania to adopt similar laws. However, Pennsylvania has a firearm preemption law, which makes it illegal for cities to enact their own local gun laws. Adorned with American flags and Gadsden flags, groups of people walked from parking garages across the city, all heading to the Mayor’s office. Christopher found out about the rally from his friend Kaitlin Bennett, who was also present and spoke at the rally. Kaitlin Bennett, if you can recall, drew national attention when she posted photos of herself on Kent State University campus with an AR-10, she was also the President of the Kent State’s chapter of Turning Point USA. 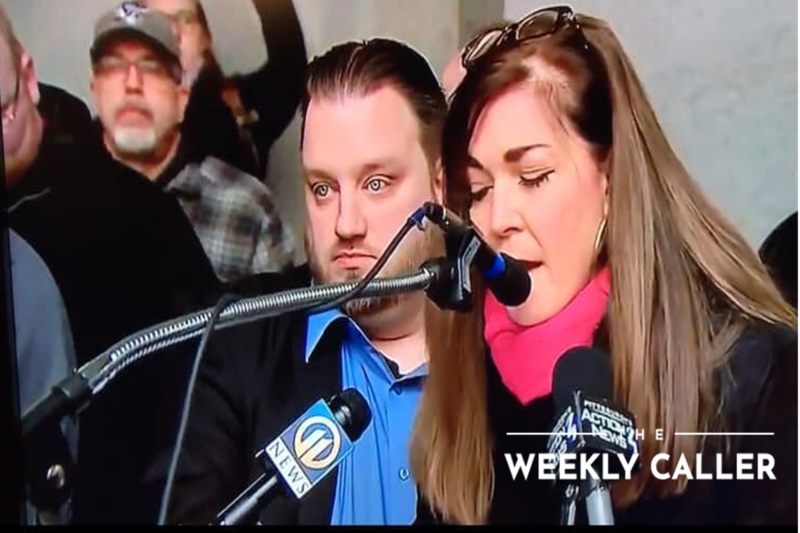 Christopher went on to tell TheWeeklyCaller: “I was contacted by my friend Kaitlin Bennett (the KSU gun girl) and she asked if I would be attending the rally in Pittsburgh and I told her I was planning on attending. I became involved in helping bring my gun toting, flag waving Ohioans to Pittsburgh. I entered the realm of gun politics last March when I helped organize Rally For Our Rights in Columbus, Ohio alongside Ohio Carry, Ohio Gun Owners and Ohioans for Concealed Carry. I became friends with a lot of gun owners and activists all over the state. I just started spreading the word around Ohio that we needed to help our neighbors in Pittsburgh. I told them that if Pittsburgh gets away with breaking state preemption laws that Ohio municipalities would try to follow suit. Here is a short list of the event speakers. Aaron Bernstine, 10th district, state rep.
Kaitlin Bennett of Liberty Hangout and Kent State open carry activist. 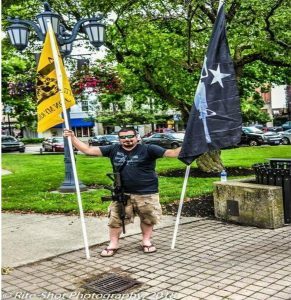 Justin Dillon, founder of open carry Pennsylvania. Sam Piccinini, current police officer, and former S.W.A.T officer in Beaver County. Cory Kepner, one of the Erie 8.